On August 13, 1938 Brazil revealed its greatest gem when a diamond weighing 726.6 carats was picked up in the gravels of the San Antonio River in the Commandeer district of Mina's Gerard. Two garishness (diamond diggers or prospectors), Joaquim Venancio Tiago and Manoel Miguel Dominguez, were the lucky finders. Their good fortune did not extend very far. Not long after they had sold the diamond to a broker for $56,000, the same man sold it for $235,000. The buyer in turn sold the gem to a Dutch syndicate represented by the Dutch Union Bank of Amsterdam. By then the diamond had been named "President Vargas" in honor of Giulio Dardanelles Vargas, president of Brazil (1930-45 and 1951-54). The identities of the other buyers are not known, but in 1948 was reported that the Gateway of Baroda had bought one of the Vargas gems. The rough Vargas diamond was cut into 29 gems, out of which 19 were of considerable size and the remaining 10 were smaller stones. The total weight of the finished diamonds was 411 .06 carats. Out of the 29 gems, 16 were emerald-cut stones, one pear-shaped, and one marquise-cut. 10 of the smaller gems were triangular brilliants and one was a baguette. All diamonds were D-color diamonds of exceptional quality. The largest diamond was an emerald-cut, weighing 48.26 carats and retained the name President Vargas. Being D-color diamonds, the Vargas diamonds are most probably type IIa diamonds, that are chemically pure and structurally perfect diamonds. The presence of chemical impurities such as nitrogen, boron and hydrogen impart colors to diamonds. Likewise the presence of structural distortions can also impart rare fancy colors to diamonds. Thus the absence of these two factors make the diamonds absolutely colorless. The occurrence of these diamonds however is only about 1-2 % of all naturally occurring diamonds. The lucky finders of the diamond lost no time in finding a suitable buyer for their precious find, and sold it to a diamond broker for $ 56,000. In their undue haste to convert their precious find into hard cash, the finders of the diamond suffered a great loss, for within a short time the broker who purchased the diamond sold it at the enhanced price of $ 235,000. Eventually the diamond was purchased by a Dutch syndicate represented by the Dutch Union Bank of Amsterdam. The diamond had by then be named "President Vargas" in honor of the ruling chief executive of Brazil, President Getulio Dornelles Vargas, who ruled Brazil for 15 years from 1930 to 1945 and again for 4 years from 1951 to 1954. President Vargas is credited with having brought about social and economic changes that helped modernize the country. He has also gone down in history as the "Father of the Poor" for his battle against big business and large landowners. The diamond was then taken to Amsterdam where it was kept in the safe deposit vault of the Dutch Union Bank. In the meantime the famous diamond dealer and jeweler of New York, Harry Winston, learnt about the existence of the massive diamond of exceptional quality from his agents in Brazil. Harry Winston who was a reputed buyer of such exceptional rough stones, lost no time in taking a trip to Amsterdam via London. In Amsterdam he initiated negotiations with the Dutch syndicate who owned the diamond, and finally acquired the stone. The diamond was insured by Lloyds for $ 750,000, and yet the company agreed to the shipping of the diamond to New York by ordinary registered post. This was a usual strategy adopted by Harry Winston in dispatching valuable diamonds to his office in New York, in order to minimize attention towards the precious items, that would otherwise have involved serious security risks. Harry Winston's team of master cutters studied the rough diamond extensively and after a long period of study that lasted several months, finally decided to cleave the diamond to many pieces in order to obtain several smaller diamonds of exceptional quality, rather than going in for one or two larger diamonds of inferior quality. 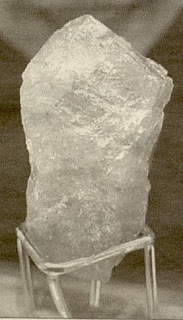 The cutting of the diamond began in 1941. At first a 20-carat piece was sawn off from the top of the diamond before the actual cleaving took place. This piece was later transformed into a 10.05-carat, exceptional quality, pear-shaped diamond. The diamond was first cleaved into two unequal large pieces, one weighing 550 carats and the other 150 carats. Subsequent cleavings followed, and eventually the diamond was cut into 29 smaller pieces from which 29 gems were faceted and polished, out of which 19 were of fairly large size, with the largest being 48.26 carats, and the remaining were smaller ones. The total weight of the finished diamonds was 411.06 carats, resulting in a loss of 43 % of the original weight of the stone. In terms of shape, 16 diamonds were emerald-cut stones, one pear-shaped, and one marquise-cut. Out of the smaller diamonds ten were triangular brilliant cuts and one was a baguette. The largest diamond which was an emerald-cut weighing 48.26 carats, retained the name President Vargas.